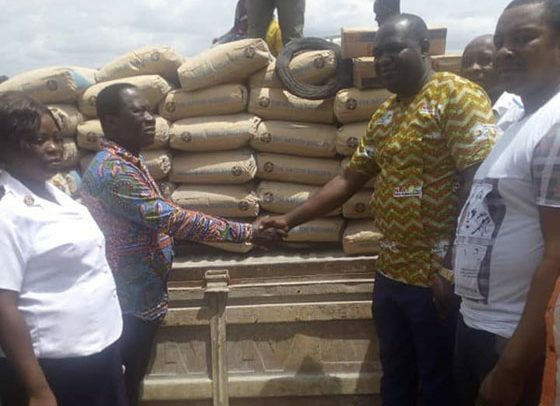 THE District Chief Executive (DCE) for Asene Manso Akroso in the Eastern Region, Alex Incoomon, on behalf of the assembly in the area, has donated close to one thousand bags of cement to some communities in the area to aid the construction of some building projects. At Akyem – Tabita community, the donation was made to support the construction of a 3-unit classroom block with an office and a store. He also donated tons of bags of cement, iron rods and other building materials to the PTA of Asene Salvation Army Primary School for the commencement of a 2-unit kindergarten block with office and store at Akyem Asene. Thereafter, he cut the sod for the commencement of a multi-purpose sports complex for the Akroso Senior High School. The project, which has been on the drawing board for 10 years, is being funded from the internally generated fund of the school with support from the District Assembly. Addressing the gathering at a short but colorful ceremony to open a new chapter in the history of the school, he called on the various stakeholders in education to contribute their quota meaningfully to augment the huge investments the Akufo-Addo government is putting in education. He also announced the construction of boys’ dormitory, masters’ bungalow, and a 10-seater modern WC toilet facility for the school. The contractor for the projects has been selected and work is expected to commence by the end of May 2019. The beneficiaries, who received the building materials at the separate events, thanked the government for his unalloyed commitment to make education free from kindergarten level to pre-tertiary level, including technical and vocational training. They also promised effective and efficient utilization of the resources to ensure early completion of the project.